John Finger grew up in the San Francisco Bay Area’s Diablo Valley and graduated from the California College of Arts and Crafts (now CCA) in Oakland in 1977. He has traveled extensively around the world from Europe to Asia visiting art centers and collections, drawing from the works of the masters at these sites, and sketching and painting areas of interest and natural beauty. 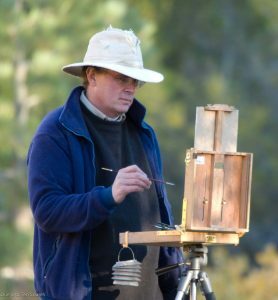 Though most well known for his landscape painting, John continues to work on several painting series both in his Northern California studio and plein air including painting portraits, the figure and “anything else that needs painting”. John resides and has his studio in Walnut Creek, California where he paints both in oil and in watercolor.